For me this is the biggest annual sporting event of the year outside of Rugby League and Football. 3 weeks of the toughest endurance race on the planet, which unfortunately has been tarnished by the use of drugs for pretty much all of its existence. This blog's been a bit football heavy recently hasn't it? Well let's move the spotlight away from South Africa for a moment. As we've had quite a lot of sport going on elsewhere this summer. And sport of a very high standard. It's just a pity that it has been put into the shade by the looming shadow cast by the World Cup. Well... cricket, tennis & Formula 1, come out of the corner for a second and bask in the spotlight. You've earned it. England's best player, making two good saves to keep the contest going longer than it should have done. Commanded his box well but should have done better with Muller's first goal. But he can leave the pitch with his head held high. 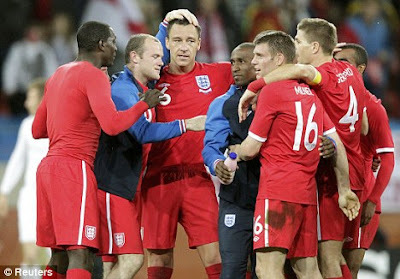 England were on the receiving end of a harsh footballing lesson as they received a chastening 4-1 defeat to Germany. In what was England's heaviest defeat in World Cup football, it was England's experienced players who looked callow and mentally fragile, while Germany were assured and organised. It was the Germans who carried out their manager's instructions to the letter. When you next get a chance, have a look around you. It's not easy to forget that the World Cup's on, is it? Sitting in my office at work the other day, I couldn't believe how much football paraphernalia (especially regarding England) adorned the walls. And if you don't work in an office it makes little difference. Wallcharts and flags on the windows of houses, those same flags on the outsides of cars annoying certain podcasters. And talking of annoying, you can even buy vuvuzelas in supermarkets (I must state that I'm a fan of the vuvuzela, but it'd be remiss of me to ignore the majority. But how I'd love that majority to be silenced if the vuvuzela could make it over to Britain during the next Premier League season). Has been a calm and reassuring presence to England's rearguard since returning against Algeria. Was unflappable yesterday. 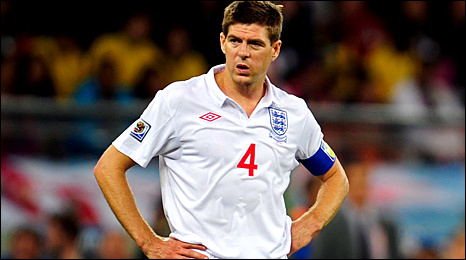 Which only exacerbates the feeling of what might have been if he had of played against the USA. A 22nd minute goal from Jermain Defoe was enough to send an improved England through to the last 16 of the World Cup. In what proved to be a tense 90 minutes in Port Elizabeth, England finally produced a performace of quality when nothing else would do. 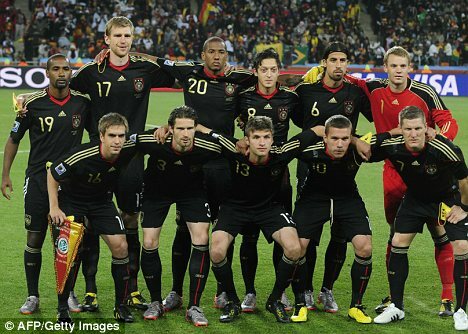 It leaves them on a collision course with Germany in Bloemfontein on Sunday afternoon. If you haven't heard, England aren't doing so well at this World Cup. In a few hours, they appraoch their final group match against Slovenia. A game in which the England team must win, or go home in embarrassment. So if England are to save their bacon in Port Elizabeth this afternoon, who will be the one to step forward to start the receovery. Cometh the hour, cometh which man? Apart from an awkward moment in the first 15 minutes, James was solid, unfussy and dependable. He fulfilled the minimum requirement of a goalkeeper and will surely stay between the sticks for the rest of England's time in South Africa. However long that lasts. A sterile England were booed out of the Green Point Stadium after a woeful performance left their hopes of making the knockout stage of the World Cup in serious doubt. England now have to beat Slovenia to make sure of qualifying for the last 16, which given events in Cape Town, is far from certain. In the 1960's the people at DC Comics took the decision to mix up the 'constants' of some of their established characters. These parallel tales gave us alternate scenarios of superheroes that had probably ever only been discussed previosuly by the kinds of people who spend too much time on the Internet, and have too much idle time on their hands (in short, people like me). So now Batman marries Selena Kyle, Superman creates a world sans superheroes - just to see if it could work & Wonder Woman falls through a space-time warp and encounters her double. 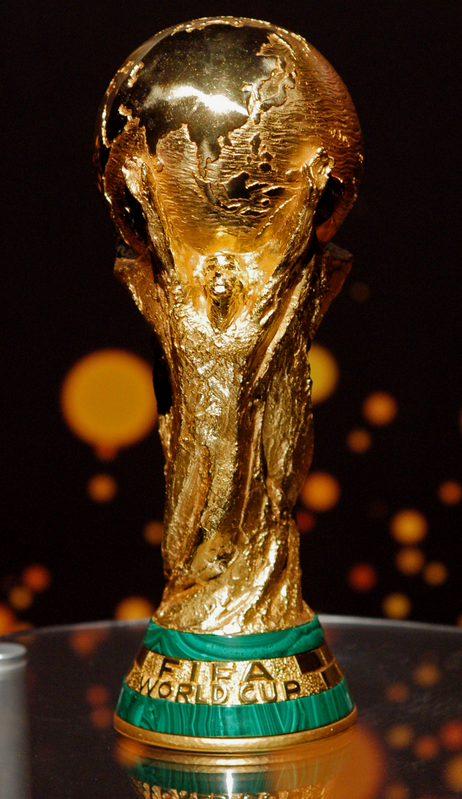 Been enjoying the World Cup so far? 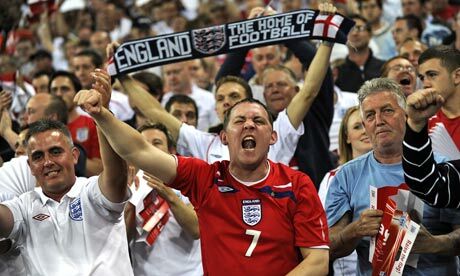 England's draw with the USA aside, the first four days of competition have been greeted warmly by the watching fans, but it has also been accompanied by a collective groan that this tournament may have a touch of 'The Emperor's New Clothes' about it. Made a good save to keep the score at 1-1, and hardly put a foot wrong. But the one he put wrong was damaging. Mistakes are never more costly then when one plays in goal. I hope he can recover but the fact is that England would have probably have won the match if it wasn't for his error. A goalkeeping howler from Robert Green combined with a resilient defensive display from the USA continued the early trend in this World Cup for drawn games. Fulham's Clint Dempsey's speculative shot from outside the area squirmed through Green's gloves in the 40th minute and England were left frustrated in the second half, banging on the USA's door with increasing desperation for the winning goal. The current European Champions and favourites. 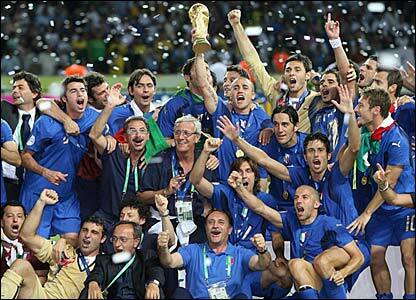 Two years ago they played some wondrous football to deservedly win Euro 2008. They have only lost one match since November 2006 and have an embarrassment of riches on their playing staff, especially in midfield. This is borne out by the coach, Vicente Del Bosque leaving Villareal anchor-man Marcos Senna at home. Senna was a key member of the Euro 2008 side and would walk into most other teams. But like most World Cup favourites, I think Spain will fall short of winning the double of Euro & World titles achieved by France in 1998 & 2000. While they have the world's best midfield and are technically the best side in the competition, they, like Barcelona, like to play very narrow. And if you can clog the centre of the pitch and keep the masterful Xavi Hernandez quiet, then you can blunt Spain's primary weapon. Also, if they were to suffer injuries or suspensions to the centre half or centre forward positions then the squad can look a little light on depth. Most worrying of all, the one defeat they suffered in the past 4 years was in last summer's Confederations Cup to the USA. 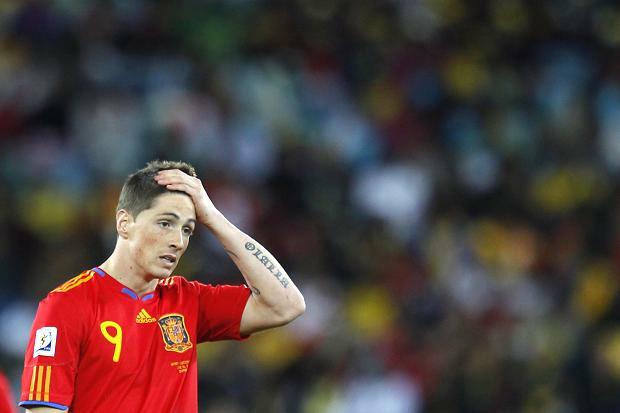 While the loss is nothing to panic about, the manner of it may give Del Bosque sleepless nights. The Americans looked to have uncovered the blueprint in how to stop Spain and I'm sure that the world's leading nations would have taken notice in how to nullify them. However, they're favourites for good reason. Their midfield is the strongest in South Africa, their Confederations Cup experience means they will be used to the tournament's stadia and conditions. And while they have a tough draw in the knockout stage, I think they will come very close to victory. But only close. First things first, can we give "this Brazil team aren't like the traditional samba football Brazil sides of the past" a rest? Brazil haven't had a team like that since 1982. And what happened then? They played some of the most attractive football ever seen at a World Cup, got beaten by Italy in an absolute classic quarter-final tie, and are regarded by some as the best side never to have won the World Cup. This incarnation of Brazil remind me of their 2002 team. And what happened then? They made sure they were solid at the back, with three centre halves and two holding midfielders. Keeping a minimum of 8 men behind the ball meant that their flair attacking men could focus on hurting the opposition. How did that work out again... oh yeah, they went on to win the whole thing. And it has to be remembered, a functional Brazil team is still more expansive than most. Despite leaving Ronaldinho & Alexandre Pato at home they still have the tools going forward to score against anyone. Elano & Robinho either side of the handful that is Luis Fabiano up front (think Emile Heskey with a goal threat). And then there is Kaka. Maybe the most graceful footballer on the planet. He has had a injury-laden first season at Real Madrid, but has regained full fitness just in time for this summer's shenanigans. As long as he stays fit, I back Brazil to win in South Africa. The only thing that I can see preventing them is injuries to key players. The World Cup wild-cards. Man for man, they have the strongest set of players. But they have a coach in Diego Maradona who is an accident waiting to happen. His selections throughout Argentina's qualifying campaign and their current squad have been inexplicable and even capricious. To leave out one of the world's premier full backs and it's best anchor man in Javier Zanetti & Esteban Cambiasso smacks of stupidity. But even so, they bring the best forward line to South Africa. Gonzalo Higuain, Sergio Aguero, Carlos Tevez, Diego Milito and... oh, there's someone I'm forgetting, what's his name...little fella...oh, it's on the tip of my tongue. Oh yes, one Lionel Messi. Messi has underperformed for his country, but if he produces his best like he has for his club, then he can carry Argentina to victory on his own, very much like the way he took Barcelona to the La Liga title. It's a nigh on impossible task to predict how far this side will go. But that's hardly going to stop me. I can see them losing in the first knockout stage or featuring in the business end of the competition. And as they are unbeaten in their last five games, beating Germany (in Germany) in one of them, I will warily plump for the latter. Not much has been said about the Holland side in regards to the competition's potential winners. I think they are dangerous. Here's why. The cooler climate in South Africa will suit many of the Northern European nations. And when you look at their attacking names, they have the talent to beat all-comers. When you line up with Robin Van Persie, Arjen Robben & Wesley Sneijder in your forward line, with Rafa Van Der Vaart as an option off the bench, this is a team to be taken seriously. These men are all capable of winning a match on their own. What goes against the Dutch is their tough half of the draw and their crumbling defence. England showed up their weaknesses last August, and the goal they let in against Cameroon last week belonged in a Harold Lloyd film. They will also miss the presence of the now retired Edwin Van Der Sar. The key will probably lie in their fearsome forward line compensating for their inability to keep the ball out at the other end. They may knock out a major power but their poor defence could be their undoing. My dark horses. Well we all know the line. Repeat after me - "never, ever count out the Germans". Do I dare do so this time? Well...kind of. The problem with Germany this time around is the cruel luck they've had with injuries. Both first choice centre midfielders are missing, as are two of the possible replacements. It's got to the stage where full back Phillipp Lahm may be pressed into emergency service as a holding midfielder. Also, while they have a strong forward line it's either out of form (Lukas Podolski) or has had little first team action this season (Miroslav Klose & Mario Gomes). They seem to be a little more disorganised than we usually see with Germany and they have a coach who is not rated highly by some (unfairly in my view). While they will always be a tough proposition, I think their injuries mean that Germany will go out to the first good side they come up against. But then again, it is Germany. Am I tempting fate by writing them off? Ok, first I'm going to pour some cold water on these empty pronouncements of us going all the way this time. This isn't our best chance since 1966. That was four years ago. We had a better side then. And when playing against the world's best teams, albeit in friendlies, England have looked short of the technical nous needed to beat them. Also, there is a worrying lack of depth in the squad that means England look short of an effective Plan B. As I write, captain Rio Ferdinand has been ruled out of the tournament with injury. It leaves the England back-line low on pace and mobilty. England's defence has been far from solid for about three years now and could be made to look silly by an attack with quickness of thought and deed. Now the good news. We have a better coach than four years ago and a much more coherent game plan. Fabio Capello shrewdly constructed a system engineered to get the best out of our two most dangerous attacking players, Wayne Rooney & Steven Gerrard. The quarter-finals has been a glass ceiling for England in the past. If they are to break through this then those two men, in conjunction with the indefatigable Frank Lampard, will need to have strong tournaments. The climate and fortuitous draw should also be to England's advantage. And belief will be key. Capello is targeting a place in the final and knows that the stubbornness inherent in the best England sides can make up for the technical shortfall in the squad. It was conspicuous by its absence four years ago. It cannot afford to go missing this time. It would not do to ignore the current holders. But that's the only reason why I'm devoting any time to them. They were mediocre in qualifying, have been shambolic in the warm-up friendlies and they look shorn of the cutting edge that took them to the summit of the game back in Germany. I also don't buy the "Italy always come good when it matters" theory. They have tournament experience but they looked no better than average at Euro 2008. You may have noticed that the image I've used is from the last World Cup. Simply because the fact is that they largely have the same group of players that won the competition last time around. That is both a negative and a positive. If they can mask the bulk of their negatives then they won't be easy opponents. Also, they have a laughably easy group and a brilliant keeper in Gigi Buffon. In knockout football, an inspired goalkeeper can take a side far. It's what happened with Germany at the last World Cup. Another country who were woeful in qualifying. But I would be remiss to discount a side containing Cristiano Ronaldo. Equally as important is that for the first time in recent memory, the Portugese look to have finally found a striker with a goal threat. Expect Liedson to take a lot of the pressure off Ronaldo. And I think Manchester United's Nani could be one of the stars of the competition. Also, the fuss surrounding their group has been overstated. The Ivory Coast look to be a talented but ragtag bunch, and without Didier Drogba, I sadly think that Portugal will defeat them comfortably. Similar to Holland, Portugal look vulnerable defensively. If Liedson and Ronaldo both shine, then Portugal could be the World Cup's unspoken danger. Let's ignore how they got to South Africa. It's done and no amount of uproar will change that. Any side that can bring Franck Ribery, Thierry Henry, Florent Malouda, Yohann Gourcouff and Nicolas Anelka to the party has to be taken seriously. However, this is negated by their clown of a coach, Raymond Domenech. While the French FA have done the right thing by replacing him with Laurent Blanc after the tournament, it may not have been so wise to publicly announce it. The atmosphere in the French camp is known to be pretty rancorous and could be exacerbated by the team instructions coming from a man who the players seem to have little respect for and is leaving soon. If you hated your boss would you pay them much attention if they were leaving their position? If you're looking for a World Cup shock, your first port of call should be Les Blues. KEY MAN - Franck Ribery. My Prediction - Group Stage. So there you have it. That's how I think things will pan out. Feel free to comment on why I'll be proved wrong in the next few weeks. While I would love to see an African nation perform well, I think the better African teams have either a difficult draw or injuries to their best players. In the case of Ghana & the Ivory Coast, both. But I am now officially excited about the competition. Let the games begin.